Eggs benedict are one of those treats that I only have once in a blue moon, but sometimes there’s no other acceptable option for brunch. Love love love a good veggie Benny. And a bad one can totally ruin an otherwise fabulous morning. Those of us who are on a gluten free diet might think that means the end of Benny joy, but not so. Nice golden quinoa patties solve the muffin problem perfectly. This stroke of inspiration occurred to me while Kyle & I were spending a cozy winter weekend at the fabulous Sawtooth Hotel in beautiful Stanley, Idaho. In addition to stunning views of the Sawtooth Mountains, the Hotel boasts a terrific menu complete with quinoa croquettes, roasted veggies and poached eggs for breakfast – perfect for those of us following the Body Ecology program. (If you’re on a “see food” diet, don’t worry, there are also plenty of tasty offerings at the hotel not approved for these other diets!) However, on the second morning, I started whimpering wistfully as the waiter told us about the special Eggs Benedict they were offering. 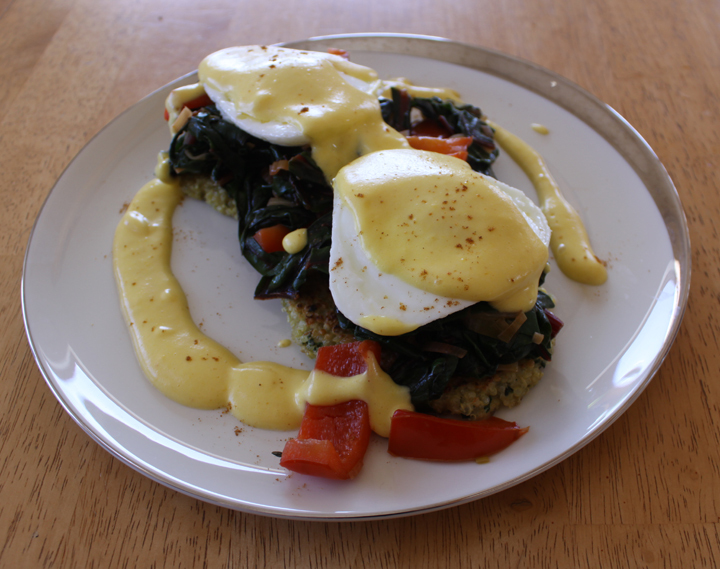 Halfway through our healthy (yet very tasty), hollandaise-less breakfast, it came to me. Yee-haw! 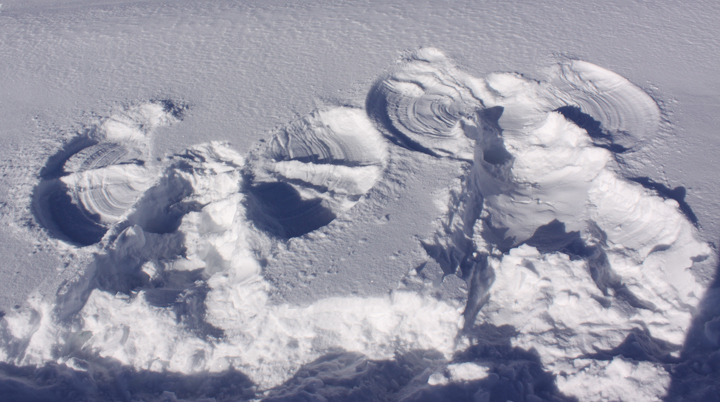 Even snow angels jump for joy with hollandaise! Like some of the best things, this baby takes time. If you can plan ahead, I recommend making the quinoa patties the day before, just so your audience doesn’t have to wait till noon for breakfast. 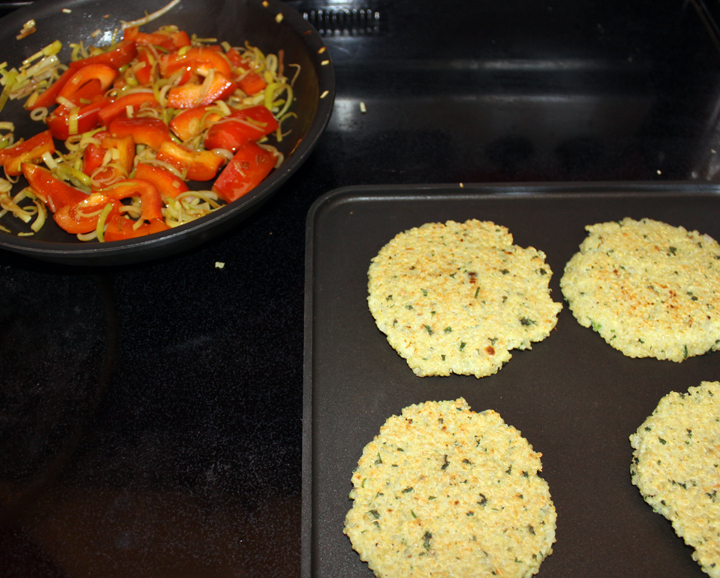 To make the quinoa patties, mix everything together well. Heat up a skillet or griddle on medium/medium-high. Form patties about 4 inches wide by 1/2 inch thick and cook until slightly golden on both sides. Keep warm until ready to plate, or refrigerate until ready to use and reheat. Saute leeks in olive oil until wilted. Add red pepper and cook until almost tender. Add Swiss chard and cook until all veggies are done how you like ’em and set aside. To serve, put a couple quinoa patties on a plate, top with sautéed veggies & sliced avocado. Plop a poached egg on top of each and drizzle, spoon, or pour (depending on how decadent your tastes run) hollandaise on top. Sprinkle with a bit of cayenne if you want a little extra kick. 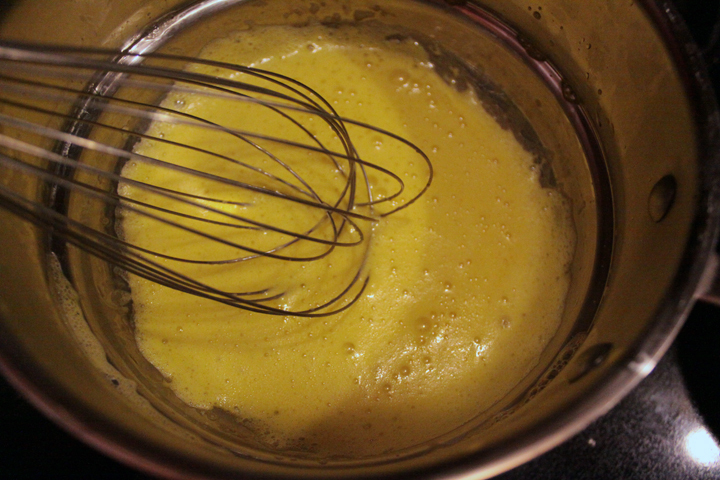 Enjoy right away since hollandaise is best right off the stove. Mmmm, Benny. And check out the Sawtooths! If you haven’t been to Idaho, you are seriously missing out! This entry was posted in Breakfast, Recipes and tagged Candida Diet, Gluten-Free, Vegetarian by Brooke Bonner. Bookmark the permalink.